Cabasse Antigua review | What Hi-Fi? Cabasse is arguably the most creative of France's specialist speaker manufacturers. For evidence take a look at any of the company's long line of weird and wonderful high-end designs. So, it comes as something of a surprise to see the company dish up such a conventional-looking two-way standmounter. That said, there are deviations from the norm. 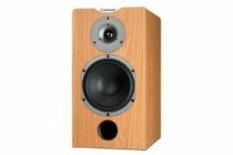 Firstly, this speaker is unfashionably large, measuring 41cm in height. A generous internal volume, and similarly generous mid/bass driver would suggest loads of bass and volume. Sensitivity just short of 90dB/W/m should mean decent volume with low-powered amps, and the lack of biwire capability is no bad thing – we recommend using a single run of quality cable as opposed to two budget-wire runs. Once properly run-in, the Antiguas please and disappoint in broadly equal measures. On the positive side they go loud and have no trouble filling reasonably sized rooms. The integration between the drivers is nicely done, making for a lucid and explicit midrange performance. We like the way this works to communicate the emotion in songs such as Alicia Keys's Distance and Time. Ominous music such as The Dark Knight OST sounds neutered, and shortfalls in large-scale dynamics and timing precision mean the results come up short on outright entertainment. A slightly overcooked treble and touch of haze across the presentation doesn't help, either. In our opinion the Antiguas are something of a missed opportunity. There's nothing wrong with the basic ingredients, but the recipe needs some work.